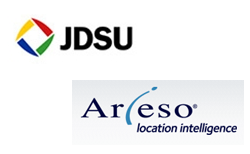 JDSU announced the acquisition of Arieso, a developer of location-aware software for mobile network operators, for $85 million in cash. Arieso, which is based in Newbury, United Kingdom, offers a multi-vendor, location-aware network monitoring and optimization solution that delivers intelligence for more effective network performance engineering. It also supplies an automated network planning technology that searches all possible configurations to deliver optimum network designs. Arieso said its proprietary algorithms provide highly rich and targeted data from mobile connection events to give mobile operators visibility into service level activity and usage patterns. Arieso’s bookings for calendar 2012 were approximately $27 million. JDSU said the acquisition advances its mobility strategy by extending visibility all the way to the subscriber location, providing critical intelligence that allows radio access network (RAN) optimization teams to maximize return on investment by identifying ideal locations for small cells and other self-optimizing network enhancements with surgical precision, across the widest range of technologies and vendors. JDSU will integrate Arieso’s products with complementary solutions such as PacketPortal, JDSU’s open software platform, providing end-to-end visibility across mobile networks. Globally, the femtocell market, including 2G, 3G, and 4G femtocells, rose 66% in 4Q12 from 3Q12, according to a new report from Infonetics Research. 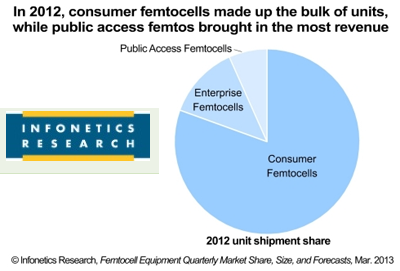 The firm estimates the femtocell market totaled $425 million for all of 2012, up 21% from the previous year. The top 3 femtocell market share leaders in 4Q12 and for the full year 2012 are Airvana, Samsung, and Cisco/ip.access. 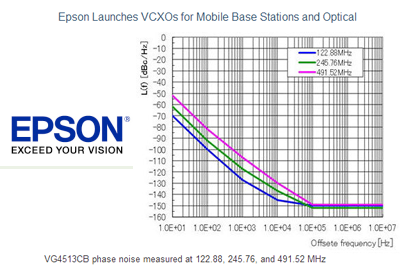 Epson Electronics America introduced series of voltage controlled crystal oscillators (VCXO) designed for optical networking and LTE base stations. The Epson VG-4513CB uses a high-frequency fundamental crystal to achieve output frequencies up to 500 MHz with no spurs and very low phase noise and low jitter. The company said its new device is 87% smaller than existing VCXOs. It can deliver output frequencies up to 500 MHz without using a PLL or frequency multiplier. 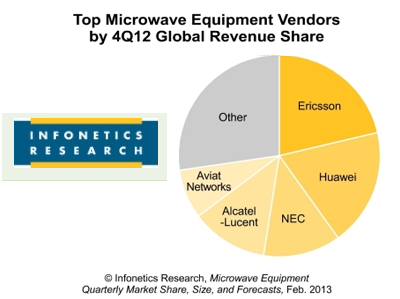 The global microwave equipment market totaled $1.2 billion in 4Q12, down 3% from 3Q12, and down 12% from the year-ago 4th quarter (4Q11), according to a new report from Infonetics Research. Microwave equipment spending declined 10% worldwide for the full year 2012. "The microwave equipment market ended 2012 tamely,” reports Richard Webb, directing analyst for microwave and carrier WiFi at Infonetics Research. “The expected year-end boost to quarterly revenues did not materialize, as price erosion and capex conservation combined to deliver a seasonally countertrend 4th quarter dip. We expect the market trough to hang around a little while longer before renewed growth begins in late 2013,” Webb continues. “And by 2017, Infonetics forecasts the microwave equipment market to reach $5.2 billion, powered by the continuing demand for backhaul capacity at macrocell sites." Alcatel-Lucent continues to lead the all-packet segment, accounting for half of all revenue. The latest labor agreement reached between AT&T Mobility and the Communications Workers of America on Feb 22 includes general wage increases in each year of the four year contract -- 2 percent the first year, 2.5 percent the second year, 2.25 percent the third year, and 3 percent the fourth year. It maintains pensions for all employees, plus retirement savings plans, with no changes. The four-year agreement covers approximately 20,000 Mobility employees in CWA Districts 1, 2/13, 4, 7, and 9 – generally in the Northeast, Mid-Atlantic, Midwest, Mountain States and West Coast. It will be submitted to the CWA's membership for a ratification vote in coming days.